May is finally here and with the new month comes an exciting schedule of celebrations, festivals and live entertainment in Asheville! 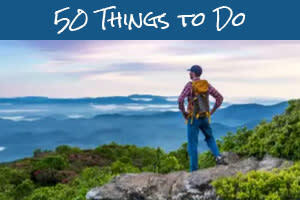 This weekend, Asheville hosts events dedicated to food, wellness, music, art and the outdoors. Just wait until you see all you have to choose from in the coming days! With so much planned in the month ahead, make sure you don&apos;t miss out. 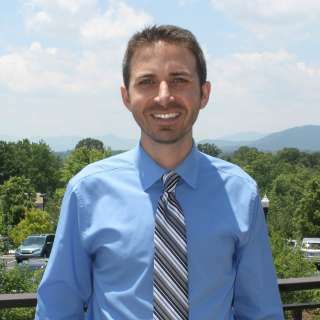 Plan your trip to Asheville by utilizing our easy-to-use search to check room availability and rates at Asheville area accommodations. And, you can check events for any date by using our events calendar search. Break bread with professional bakers and bread enthusiasts at the 14th Annual Asheville Bread Festival at New Belgium Brewing. The main event for the public is the bread fair on Saturday (May 5) from 10 a.m. to 2 p.m. Local/regional artisan bakeries will sample and sell their breads and pastries. Area mills will sell flour. And, there will be many baking and culinary books available for sale. The bread fair is free to attend. The festival theme is “A Celebration of Rye” and will feature keynote speaker Stanley Ginsberg, author of the critically-acclaimed baking book, "The Rye Baker." In addition to the main bread festival activities, there will be hands on workshops and lectures Saturday in and around Asheville ($15 for workshops). On Saturday evening, three teams of bakers will use three pizza ovens to roll out amazing artisan pizzas for the crowd! See the Asheville Bread Festival’s web site for a full list of events. 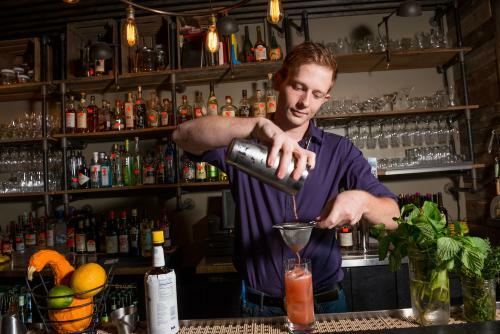 Raise a glass to the first full week-long cocktail event in the Southeast. Asheville Cocktail Week features training and seminars, pairing dinners, spirit tastings, cocktail parties and cocktail competitions. This weekend, attend an event showcasing how to mix and use unconventional ingredients to create delicious beer cocktails, a Kentucky Derby Party and a Cinco de Mayo Dance Party. Please see the festival&apos;s web site for a full list of Asheville Cocktail Week events. Friday (May 4): 8:30 a.m. to 5 p.m.
Saturday (May 5): 8:30 a.m. to 5 p.m.
Sunday (May 6): 10 a.m. to 3 p.m. 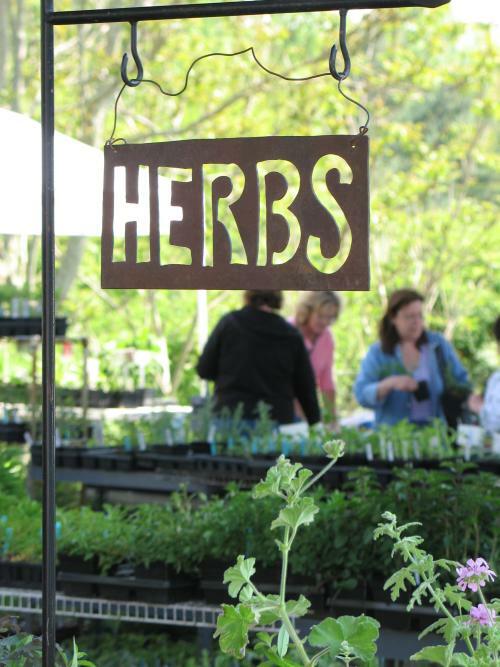 Explore one of the largest selections of herb plants when you visit the 29th Annual Spring Herb Festival at the WNC Farmers Market. This event is considered the largest herb festival in the southeast with more than 60 businesses from the region participating. In addition to a large selection of herb plants, discover books, soaps, herbal crafts, medicinal herbs, lotions, dried flowers, herbal baked goods and other herbal gifts. Saturday (May 5), 9 a.m. to 5 p.m.
Join this free celebration of health and wellness in a beautiful location just 20 minutes north of Asheville. For the second time, Prama in nearby Marshall hosts its Prama Day with free wellness classes, workshops and activities. These activities include yoga, meditation, sound healing, dance and tours of the Wellness Center. 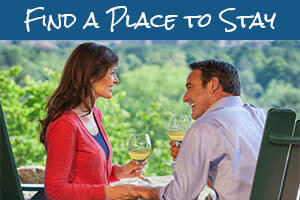 You can also purchase a delicious and nutritious meal and take advantage of the hiking trails. There also will be activities throughout the day for children. 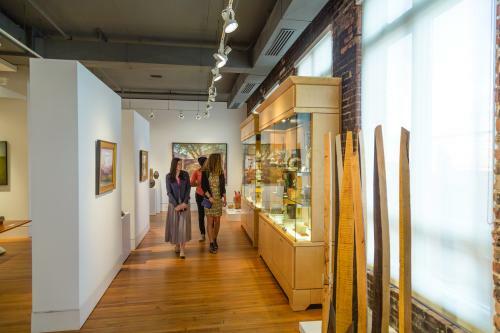 Friday (May 4) 5-8 p.m.
Head to downtown Asheville to explore more than 25 galleries, museums and jewelry studios that are all within a walkable, half-mile radius of the city center. The Downtown Art Walks happen the first Friday of every month (April through December) from 5-8 p.m. Many of the galleries, museums and studios host special events. This Friday, the Asheville Gallery of Art kicks off its May show, “Chasing the Light,” with an artist reception. The show features the work of painter Joyce Schlapkohl. Meanwhile, Blue Spiral 1 Gallery opens four new exhibitions. See an artist demo with wood sculptor Brad Sells (5-7 p.m.). The demo will be outside in Wilson Alley behind the gallery to accommodate his use of chainsaws and other woodworking tools. Friday (May 4), 5-8 p.m. In conjunction with the First Friday Art Walk downtown, local outdoor gear maker Diamond Brand will host a grand opening of a new pop up factory. The factory will allow visitors to observe the skill that goes into making each one of Diamond Brand&apos;s packs and tents. You’ll see professional sewers working with six industrial sewing machines and tackers. The factory will also feature unique products that can only be purchased at this downtown location. 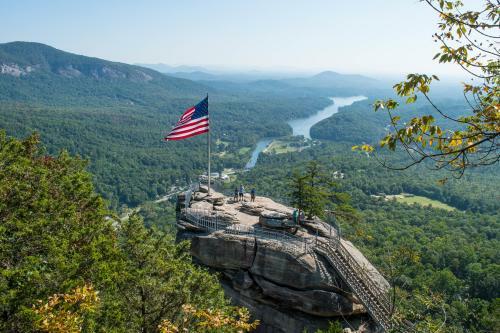 It will be open every Tuesday through Saturday from 10 a.m. to 6 p.m.
Saturday (May 5), 9 a.m. to 12 p.m.
Spring is for the birds at Chimney Rock State Park! Dozens of species of birds migrate through the area at this time of the year as they head north. Join rangers at Chimney Rock State Park for a guided walk to see how many different bird species you can see and hear. Don’t forget your binoculars! The hike is considered easy-to-moderate. Enjoy a weekend-long outdoor adventure and music festival on the banks of the beautiful French Broad River in Hot Springs. Hot Springs is located just about 45 minutes northwest of Asheville. Music performances will include The Travelin’ McCourys, The Jeff Austin Band, The Grateful Ball, Billy Strings, Jon Stickley Trio, Sol Driven Train, Dangermuffin, Fireside Collective, HipGnostic and The Pond Brothers. In addition to a big music lineup, the festival features activities for children, fireworks, whitewater and mountain bike races and late night acoustic jams. The festival began years ago as a benefit event and has donated more than $200,000 to local charities. General admission weekend passes are $110 in advance or $125 at the gate. A play on words off of May the Force by With You, these May the 4th celebrations will help you relive the classic Star Wars movies. The Conundrum Speakeasy (1 Battle Square) hosts a Star Wars Costume and Dance Party on Friday night from 6-10 p.m. The Conundrum becomes The Chalmun’s Cantina (often called “Mos Eisley Cantina”) and Asheville is “Pirate City” of Mos Eisley on the planet Tatooine! Dress as your most beloved character and you could win a prize! Habitat Brewing (174 Broadway St.) will have its first May the 4th Be With You Beer Fest, a celebration of Asheville’s craft brew community and the Rebellion’s struggle against the empire. The festival will feature theme small batch brews and the original Star Wars movies playing on VHS! There will also be a costume contest. Sunday (May 6), 8 p.m.
Comedian, actor and author Michael Ian Black puts on a show at Asheville’s The Orange Peel. He began his career with the legendary sketch comedy group and MTV hit show, The State. Since then he’s been featured on NBC, VH1, TVLand, Comedy Central and Netflix. He’ll be joined by Nick Thune, a comedian and actor who has appeared on The Tonight Show 10 times. He performs comedy to crowds around the world. This festival brings together some of the world’s finest electronic and experimental musicians. They’ll be joined by local artists for two days of compelling live music and innovate technology. Music styles will cover a broad spectrum and performances are guaranteed to be creative and original. 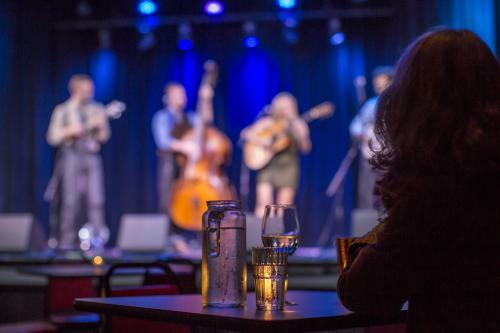 Here’s just some of the great live music performances you can enjoy in Asheville this weekend. See our full live music events calendar for more great shows. The National – American alternative rock band. Winner of a Grammy Award in 2017. ExploreAsheville.com Arena, 8 p.m.
Buckethead – Virtuoso guitarist and multi-instrumentalist who has released more than 300 studio recordings. The Orange Peel, 8 p.m.
Sierra Hull – Bluegrass musician/mandolin player/singer who became the first bluegrass musician to receive a Presidential Scholarship at the Berklee College of Music. The Grey Eagle, 8 p.m.
Brie Capone EP release – Powerful singer/songwriter/performer from Asheville releasing her new album. Isis Restaurant and Music Hall, 9 p.m.
Jane Kramer feat. Free Planet Radio and Billy Cardine – Internationally-recognized singer performing to benefit access to the arts for children. Diana Wortham Theatre, 8 p.m.
Kat Williams and Richard Shulman Trio – An early mothers day celebration with songs honoring love and mothers performed in the styles of jazz, pop and R&B. Isis Restaurant and Music Hall, 7:30 p.m.
Rivals Sons & J. Roddy Walston and The Business – Rock & Roll band from the beach cities of California. The Orange Peel, 7 p.m.